The annual Draconid meteor shower is expected to hit its peak on Saturday October 8. 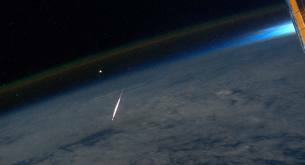 Experts say that the normally tame Draconid meteor shower is set to be exceptionally active this year, the fireworks should be drowned out by sunlight in North America and a bright moon in Europe and Asia. The event is expected to occur at 21:00 GMT and gazers will be able to see a storm of meteors from the constellation of Draco. Some of the best places to watch the Draconids this year are spots around the Mediterranean or the Middle Eas. These regions will likely have clear skies, while Northern Europe tends to be cloudy at this time of year.NASA officials said that people in North America are not going to be able to enjoy this event at all. The radiant point for the Draconid meteor shower almost coincides with the head of the constellation Draco the Dragon in the northern sky and that is why the event is best viewed from the northern hemisphere. In some ways, the Draconid shower is a real oddity, in that the radiant point stands highest in the sky as darkness falls. Unlike other meteor showers, the Draconid meteor shower is more likely to fly in the evening hours than in the morning hours after midnight. This event is usually a sleeper, producing only a handful of languid meteors per hour in most years but watch out if the Dragon awakes! Astronomers had predicted earlier in the year that this year's Draco might spew forth up to a thousand meteors in a single hour. Even if the predicted outburst comes this year the shower must compete with a big and brilliant waxing gibbous moon and as most stargazers know, the moonlight might just interfere with this spectacular show. No worries though you will still get a good show on the peak evenings of October 7 and 8. Interestingly, in mythical times this constellation was associated with the dragon slain by Cadmus, the brother of Europa. The father sent Cadmus to find Europa who was kidnapped by Zeus. But though he searched for his sister everywhere he could not find her. He consulted the Oracle of Delphi to learn what to do, and was told that his destiny was to start a great city, and to know the proper place for it by following a cow until it laid down from weariness. After he did this, the cow was sacrificed in a ritual which also required water from a nearby sacred spring; but Cadmus was unaware that the spring was guarded by a dragon (or serpent), the offspring of the god Ares, and his men were slaughtered by the monster. The spell of the oracle send him to a far away place where a terrible monster, a dragon, lived, who killed all the men Cadmus had with him. After he successfully killed that dragon, the goddess Athena instructed him to plant some of the teeth of the dragon. Surpised Cadmus obeyed the goddess and the miracle happened: Fully armed warriors began to sprout from the ground called the spartoi. He threw a precious jewel into the midst of the warriors, who turned on each other in an attempt to seize the stone for themselves. The five survivors joined with Cadmus to found the city of Thebes. Jason obtained the remaining dragon's teeth with the aid of Aeëtes of Colchis. He offered the Golden Fleece to Jason if Jason would sow them into the ground. Jason did this and successfully overcame the warriors with the aid of Medea, who gave him the means to resist fire and steel. The classical legends of Cadmus and Jason have given rise to the phrase "to sow dragon's teeth." This is used as a metaphor to refer to doing something that has the effect of fomenting disputes, rather akin to the law of unintended consequences. Metaphor: The dragon represents human DNA.